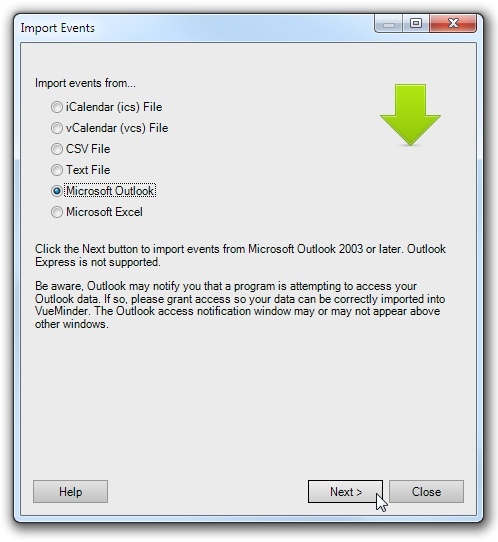 You can import calendars from Microsoft Outlook 2010 or later. If a calendar of the same name already exists in VueMinder, the imported events will be added or updated to that calendar. If the calendar does not exist, it will be created. 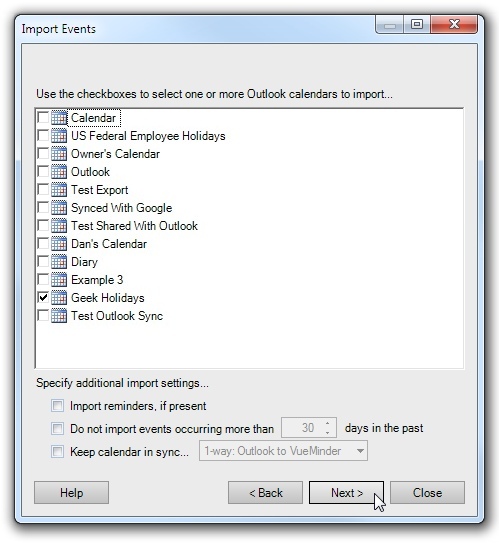 Note that if you want to keep your calendars synchronized between Outlook and VueMinder, make sure to check the "Keep calendar in sync" box on the import window. You can also use the "Add Outlook Calendar" command on the File menu or enable Outlook Synchronization in the Calendar Properties window after importing. After clicking Next, a list of Outlook calendars will be displayed, along with checkboxes to select which calendars are to be imported. In addition to selecting the calendars to import, you can also choose to exclude older events, whether to include Outlook reminder settings when importing, and whether to keep data in sync after importing. When the option to exclude older events is enabled, any events that occur more than the specified number of days in the past will not be included. The number of days can be adjusted by entering a new value or clicking the up/down arrows. After you've selected the Outlook calendars to import, click the Import button. 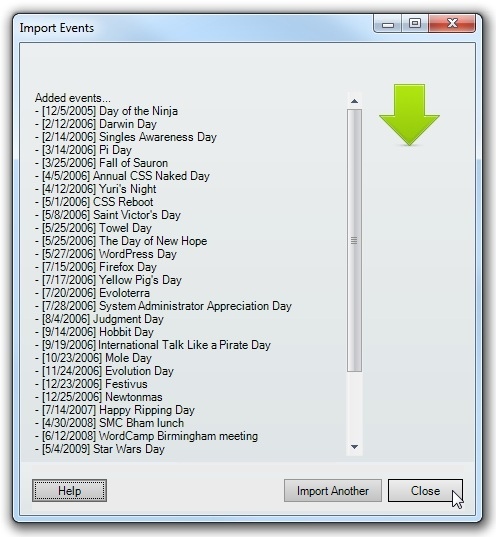 The import results will update after your Outlook calendars and events have been imported into VueMinder (this can take a few minutes if your Outlook calendar contains many events). Calendars that don't yet exist in VueMinder will be created. If duplicate events are detected, the events in VueMinder will be updated rather than new copies created.